The Marketing Society is organising an event to discuss how voice technologies are redefining the marketing landscape for the financial services industry. By Andy Pierce, Marketing Society. Venue: Royal College of Physicians, No. 6 Kildare Street, Dublin 2. It’s part of an ongoing series of events and talks which the Marketing Society continue to deliver for the Irish marketing community. Emerging technologies like Amazon Echo, Siri, and Microsoft’s Cortana among others have the potential to change significantly the way we search for information and shop. Brands, business and products have traditionally relied on strong visual cues to stand out for customers, but how will brands adapt to a world where we shop by simply asking Amazon to order us more milk? It is exactly these sort of questions that the Marketing Society look to address, providing actionable insights and learnings for their members to put into action here at home. Three superb speakers drawn from tech, finance and consulting who will bring their own individual perspective on this emerging technology and help chart a course for how brands and marketing professionals can adapt. Three speakers will look to address some of the below questions which brand owners the world over are currently grappling with. 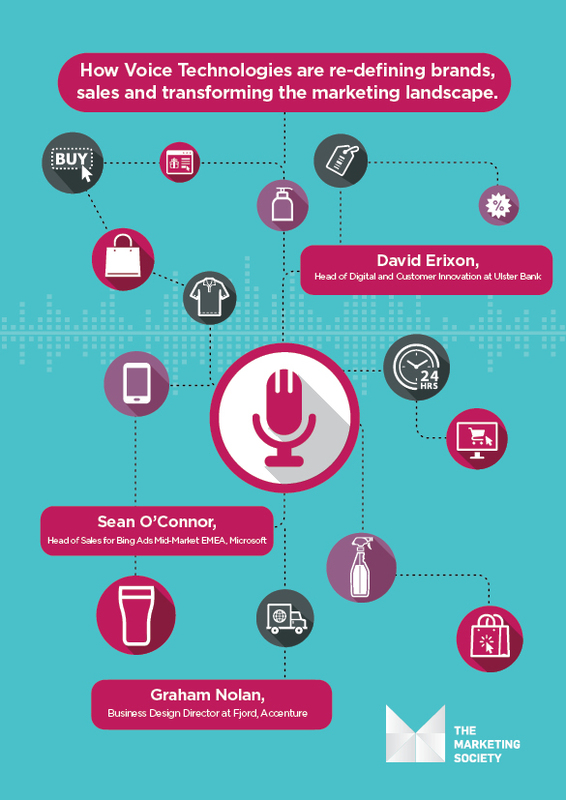 What impact will voice technology have on customers over the next few years? What types of industries and categories will voice disrupt? How are brands taking advantage now? In addition, it’s an excellent opportunity to meet some of Ireland’s leading marketing professionals in an open setting. Come with an open mind and plenty of questions. The Marketing Society considers itself to be one of Ireland’s most influential drivers of marketing in the Irish business community. They aim to help members become thought leaders and bolder marketing leaders. The society offers a central hub for our members, creating a culture for smart marketers to be better equipped and prepared to succeed in today’s business world.